Chlorination by flow is used for waters having stable biochemical quality (such as ground waters, well waters etc.) when water flow is changing in time. Commonly this type of chlorination is implemented for “basic chlorination” when raw water of similar quality is gathered in one water plant. Once established chlorine demand (chlorine consumption of certain volume of raw water) needed to reach requested chlorine residual (measured / checked in the laboratory), chlorine dosage is increased or decreased proportionally to up or down changes of the incoming water flow. As the only chlorination method this type of water disinfection can be implemented exclusively in conjunction with accurate residual chlorine analyzer and precise flow meter. Residual chlorine analyzer serves as “master” unit for displaying measured residual values with ability to interrupt disinfection procedure in the case of measured residual deviation from preset value. 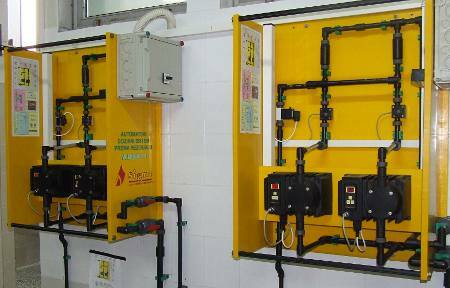 Chlorination by residual is used in case of relatively constant flow with small linear changes. Biochemical changes of water quality can be tolerated. Most frequently this type of chlorination is used for so called “corrective chlorination” when raw water comes from waterworks already primarily chlorinated to the certain level. The task of this corrective chlorination is to correct residual level (due to variable biochemical water quality – only partly due to flow changes) and to keep it to requested preset level. ADS – Automatic Dosing Systems completely satisfy all requirements for high quality and reliable drinking water chlorination in all types of waterworks with complete monitoring and storing of data.